A Fife man has been given extra jail time for breaking into a charity shop and stealing a donations tin. Serial offender George Stewart caused damage estimated at £2500 when he smashed into the shop in Cowdenbeath. Stewart was also sentenced for shouting racist abuse at a sheriff in court. Stewart (35), of Randolph Street, Cowdenbeath, was back in the dock at Dunfermline Sheriff Court. He admitted that on 22nd June at Dunfermline Sheriff Court he acted in a racially aggravated manner by shouting, swearing and making racist remarks at Sheriff Charles MacNair. Stewart also admitted that between 26th and 27th March he broke into the property occupied by Chest, Heart and Stroke Scotland, Raith Centre, Cowdenbeath and stole a charity tin. Sheriff Derek Reekie jailed Stewart for 14 months to run consecutively to his current term for separate offences. After the break-in, shop manager Carol Cook estimated that there was £2500 worth of damage caused during the break-in. 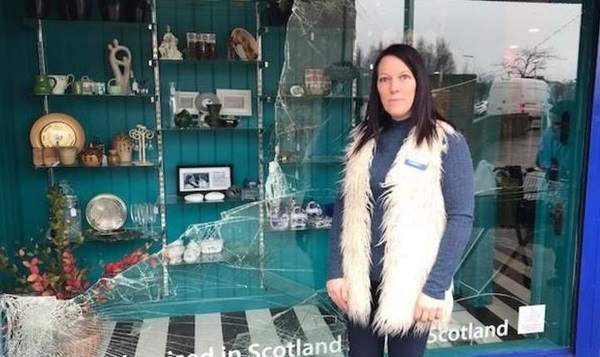 Ms Cook was shocked to find the front window smashed when she arrived at work with her colleague, assistant manager Nicol Iztta (pictured above after the break-in). She said, “We called the police and then were very wary about entering in case the thieves were still in the shop when we arrived at work. “It’s the first time this has happened at this shop and I’m angry and disappointed a charity shop would be targeted.